I had a few hours free on Friday due to the semester changeover at school. I get together with my girls fairly often for tea, but rarely with my son. So I arranged to pick him up at his office and we went for lunch together. It was fun. I hope to do it again. After lunch, since I was out towards Butchart Gardens, I stopped by for a walk. Alternating sun and clouds made for interesting photos; some drab and dull, others imbued with faint winter sunshine. There was very little in bloom, so I focused on the architecture and decor of the garden. Above are a pair of bronze herons in the star pond. 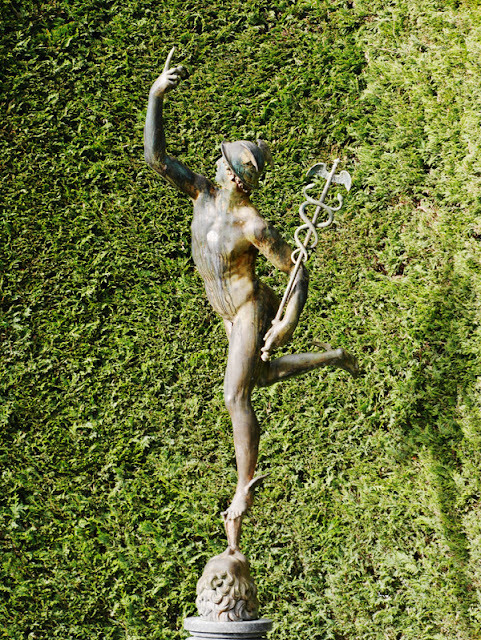 A graceful figure in the Italian Garden pond. 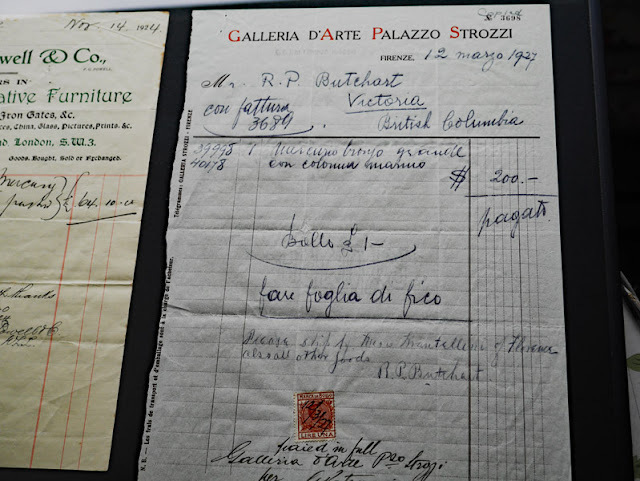 this invoice, from Italy, for that very statue, dated March 12, 1927. The interior display runs for only a few months as it takes space from the restaurant and tea rooms. They are not as busy in these months. The artifacts on display change slightly from year to year, so I like to see what's there. A view into the Italian Garden through an arch in the hedge. Mrs. Butchart's conservatory/sun room is seen in the top window. In these months of fewer visitors, I like to go against the flow of traffic and visit the gardens backwards. Do you find that you see things differently when you view them in a different order? These stepping stones, with the red bridge beyond, are one of my favourite places. All the curved lines and tangled branches juxtapose nicely. 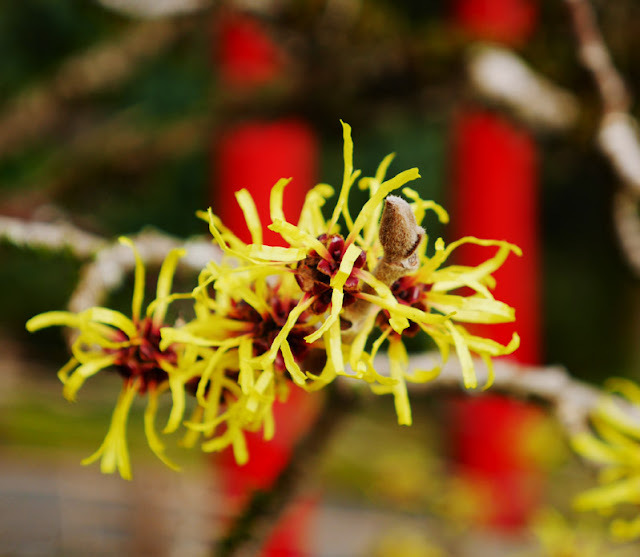 There were a few things blooming, such as this witch hazel tree. Its blooms look like a bunch of ribbons gathered together in little bouquets. The red entrance arch to the Japanese Garden is in the background. During these quieter months, the Blue Poppy cafe is turned into a Spring Prelude Garden, filled with winding pathways, flowering bulbs, and lots of orchids. I can never quite decide if I like orchids, or not. Do you? No question about the tulips - they are such cheerful flowers, especially in these vibrant shades. A little path lined with daffodils was the cheeriest thing, all bright and golden. I exited into dull grey spatters, but the golden hope of spring stayed with me as I drove home, windshield wipers flapping back and forth. I've never even thought to walk the garden against the flow...clever you! Doesn't that red bridge look so cheerful against the landscape? It must be relatively quiet at the gardens at this time of year...after the festive holiday decorations have been taken down and before the spring bulbs pop up. Still a lovely place for a walk. How nice to enjoy Butchart being able to walk about without a huge crowd. Daffodils are very cheery indeed. Hope you are having a good week. 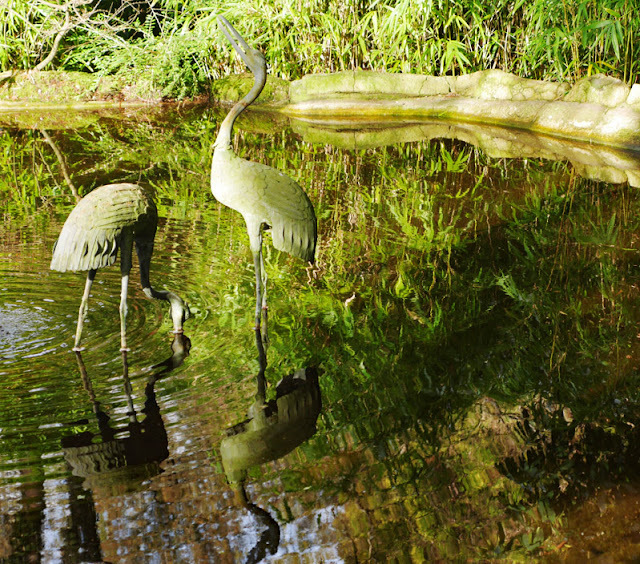 Gorgeous photos, I loved the statues. But most of all the cheerful bright tulips! Have a great week Lorrie! What a lovely place to visit and your photos have captured it wonderfully. Like you I am not quite sure about orchids although I like them when grown naturally as they are in our Royal Horticultural Society's garden at Wisley not far from where I used to live where the orchid house is beautiful. One in a pot? No thank you! You took us on a beautiful stroll, the daffodils looked amazing a joy to see. Lorrie, I always enjoy your visits to the beautiful Butchart Gardens, regardless of the season. The photo of the stepping stones leading to the red bridge is magical - love the contrast in colours but similarity in shapes. I giggled at your comment about orchids; to me they look like some form of alien beings - tulips are more my style. The daffodils are such a pretty prelude to spring, aren't they? I'm patiently waiting for the very fragrant narcissus to debut in our garden then bring it indoors to scent the house with pure floral freshness. How lovely to see so much colour in the garden. I love the scent of Witch hazel. The architectural elements are lovely. And the cheerful daffodils!! You do know how to treat yourself well, Lori. In your line of work you need to pamper yourself when you get the opportunity. The garden is the perfect place to unwind. Lovely photos. What a great idea to go against the flow in your walking of Butchart Gardens, Lorrie. My favorite photo was the one taken through the archway. I hope that one day I can visit there again. Your post on your daughter's family helping the young family, and what they did in return was so heartwarming. They are living the word of God! I so enjoyed strolling counterclockwise through Butchart Gardens with you this afternoon, Lorrie. I imagine they are stunning at any time of year but these photographs are particularly beautiful I love the glance through the archway into the courtyard in front of the house and could stand and stare at the statues for ages. Thanks for sharing your visit with us at MM this week. Such wonderful place to visit and have a cosy time to walk while admiring nature and architecture! So lovely flowers and statues, too! I enjoyed so much the bridge; but all the aspects in the pictures and collages are great! Have a very nice day and week, too! That garden is beautiful whatever the season! Thanks for sharing your January visit. Those daffodils fill my heart with happiness! My favorite flower, or at least they used to be when we lived in the PNW -- I don't see them growing very often any more, since it is too hot here in our part of Florida. So those alone would have been worth the visit to Butchart Gardens. How wonderful to live where this beautiful place can be one of your regular haunts -- and it must be great in non-tourist season. Lorrie, thanks for the tour; it's far too long since I saw Butchart Gardens. What a brilliant idea you had to take advantage of the lighter traffic and see things in reverse! Now that you've given me the idea, I'll never forget it. Such a breath of Spring air ... enjoyed the vicarious tour of the gardens. Beautiful photos. What a beautiful place and glorious photos! Spring is just around the corner....isn't it ?? Lorrie, what a gorgeous adventure! I too am drawn to the little red bridges. They remind me of the Japanese Tea Gardens at Golden Gate Park in San Francisco. I love how the garden changes through the seasons. What a treat to see the inside of the house. I was so curious. Have a wonderful week! Oh I can't imagine seeing spring flowers yet! What a nice afternoon you had in such a pretty place. I know what you mean about orchids. They're lovely, but don't seem the friendliest flowers for some reason. Unlike daffodils and tulips, which just seem to shout friendly spring hellos! Beautiful garden! 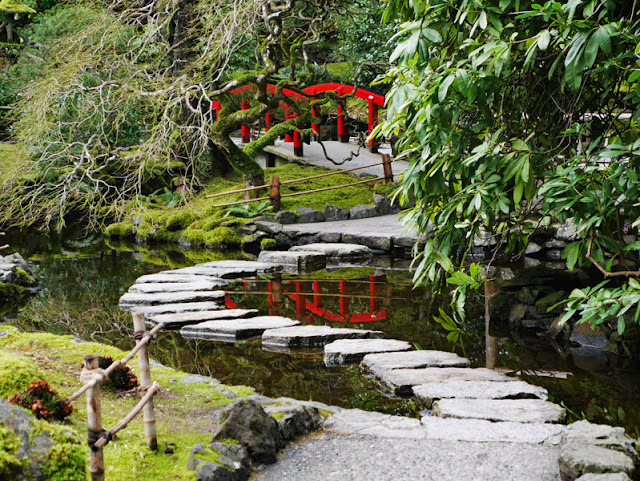 That photo of the red bridge and the winding path and water is lovely! I'm not a fan of orchids. I think they are interesting and there is such great variety but I would never buy them. Glad you had some time with your son and a lovely visit to the gardens. How lovely to meet your son and take in a tour of the gardens too! I always enjoy your posts from there, the gardens certainly are pretty aren't they. A good landscape architect shows beauty and structure throughout every season, even in a snow covered garden. Butchart has been well designed for this and the Toronto Botanical Gardens are also a lovely example of all season interest. Lunch with your son sounded like a good bonding time. Love the pretty shot of the red bridge. I'm a fan of orchids, although I have an orchid plant that hasn't bloomed in years! Okay, I know that envy is a sin, but I must admit just a tad of envy at your proximity to Butchart Gardens. I hope to see it in person someday. Your photos are just so wonderful... and I giggled aloud at your comment/question about orchids because that is exactly how I feel. I am just not sure whether I like them or not. But I love your photos and how wonderful to get to have tea with your son... a special occasion. What a wonderful site! 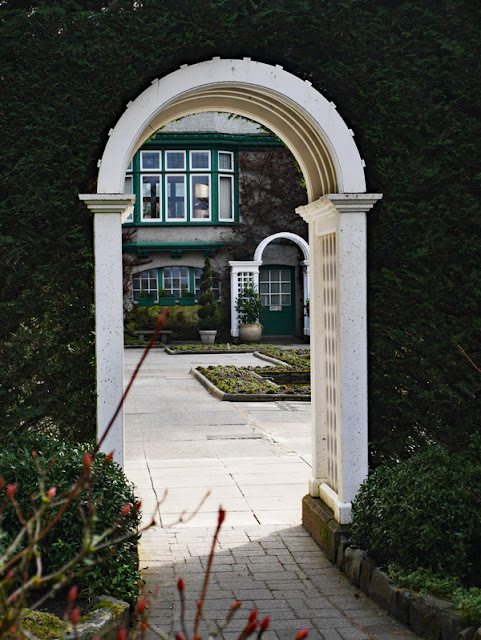 The Italian Garden looks fabulous and the entrance into the Italian Garden through the arch is my favourite view among all the lovely ones. Thank you very much for sharing these beautiful photos! Such a beautiful place to visit in any season. 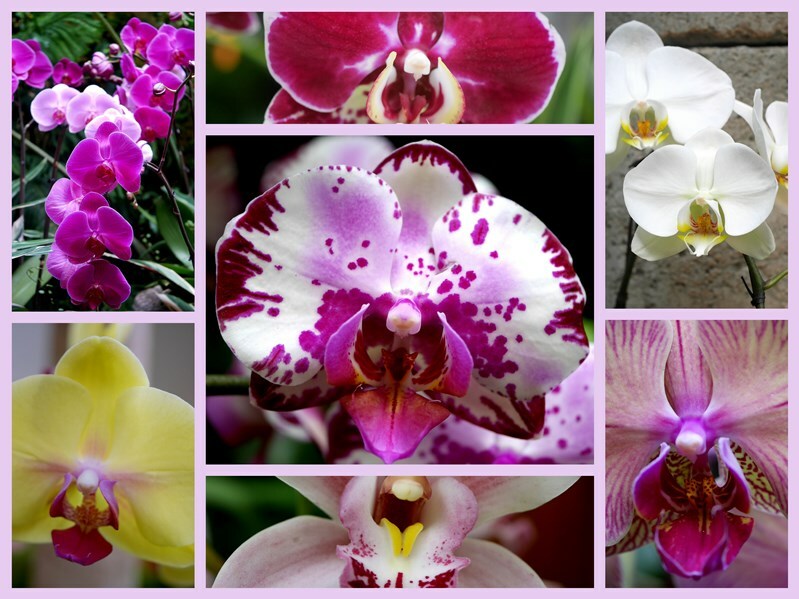 Ah les orchidées... elles sont belles mais semblent difficile d'entretien. Il paraît que ce n'est pas vrai. Beaucoup de gens autour de moi les multiplient et les font refleurir... j'ai envie de leur demander des boutures mais j'ai peur de ne pas m'en occuper correctement. Mais je pourrais tout aussi bien réussir ! Donc je suis encore indécise, comme toi. These Italian Gardens are just lovely. I can't say I've ever visited a garden (or similar place) and walked 'the wrong way round' - perhaps I'll have to give it a try. Your photo's are lovely and so good to see the colours in them. Wow! Tulips and daffodils in full bloom, amazing! I just love witch hazel. Now I need to check mine tomorrow, but I doubt it is blooming. I can't wait to once again visit these gardens. They are beautiful in every season. Thanks for sharing the beauty of the gardens. Thank you for the tour...how lovely these gardens are even in winter. Very dreary here so I enjoyed it. Lorrie, that red bridge and curvy paths is really nice. I have not been to Butchart Garden in years. I really enjoyed when I visited. The tulips are refreshing. Thanks for sharing. Sylvia D.